Roadmap for development for the Advanced Custom Fields plugin for WordPress. I am working with a team to redo a rather large NGOIt is worth noting that there are different flavors of NGOs. This particular NGO is also a non-profit charity and also a volunteer organization (most of the staff are volunteers). Not all NGOs fit this category, though I do make some assumptions in this post as if all NGOs do fit this characterization. website (both the NGO and the website are large). One of the questions through the process is How do we “dismantle a huge 1995 era website” and replace it with a “modern CMS system”? 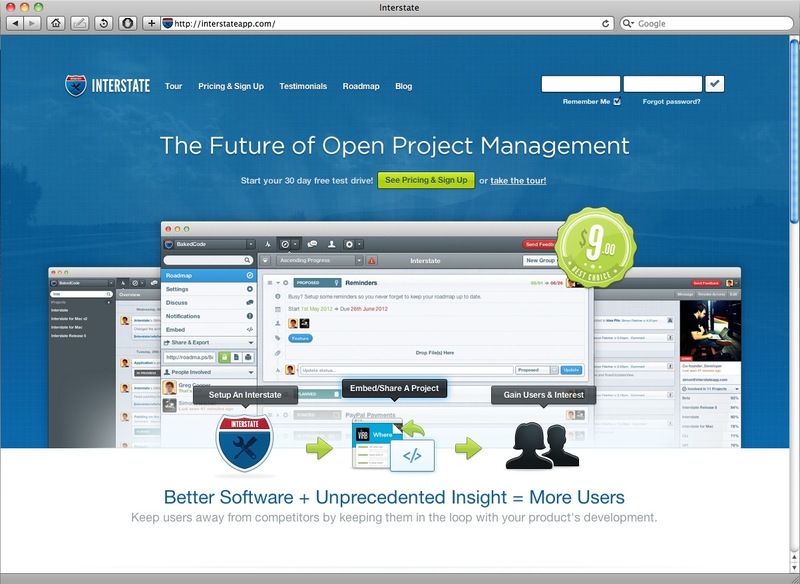 The new CMS of course is going to have to be phased in as its detailed features are built out. The social challenge is that if something which is not meeting the organizational (NGO’s) needs is replaced with something else which also appears to not meet the organizational needs then the people within the organization (the spectators, not the people directly involved with the website project) have a tendency to think that the newly launched product is a flop. The bottom line is that there is a general loss of confidence in the development and implementation team. In my particular context this often means that when people loose confidence in a development or implementation team that they stop expecting great things and start looking for other “more suitable” solutions. One way to combat this loss of confidence is to address the the people (and their concerns) who are watching the phased role-out. One part of that engagement strategy can be to do use a public Roadmap. What is a public Roadmap? There are several things which look like roadmaps, so I want to make some distinctionsIt is also worth mentioning that roadmaps are not isolated to tech projects. Sometimes they are related to a timed or staged business plan. 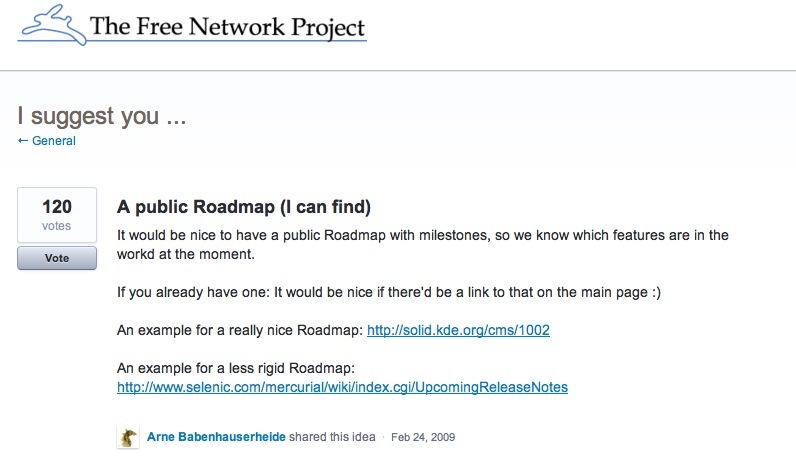 Two resources about this king of roadmaps worth mentioning are Creating a PR Roadmap[ref 1] and Creating your Project Roadmap[ref 2] . A roadmap is forward looking – listing things to be accomplished. 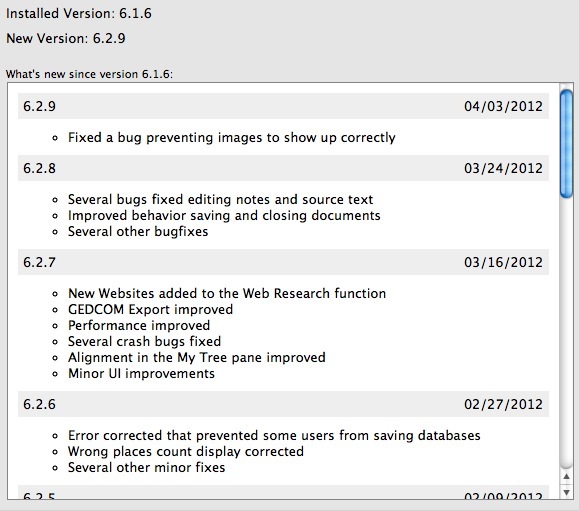 A change log or release notes is a list of accomplishments but is past oriented. A bug tracker is a list of problems and so is present-time oriented. Bug trackers are also often used to list new desired features – which can be future oriented. 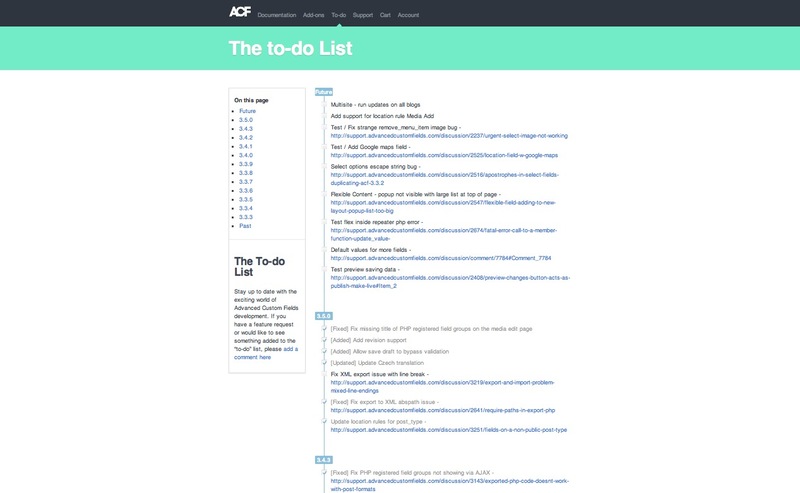 Example of a change log – designed to let the user group know that the development group addressed certain issues with the application which are of importance to the user group. 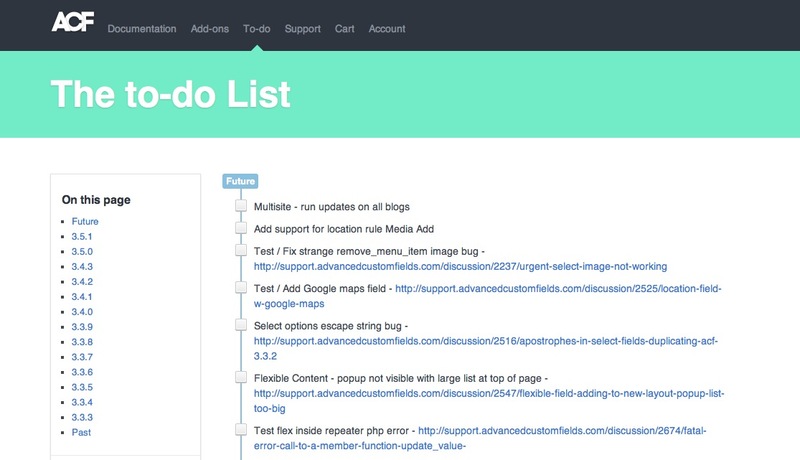 Reading this list one might say: “Wow that is really looking like software development”. And in a way really complex websites facilitating social interactions and a variety of content types and their communicative functions is like developing software. This leads us to the question: So, what do a couple of roadmaps look like visually? 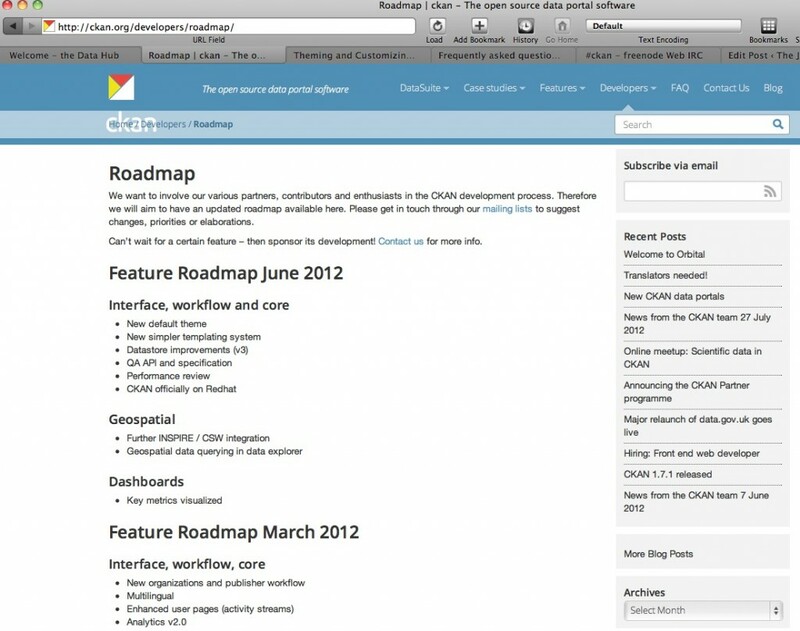 Advanced Custom Fields Roadmap designed by Elliot Condon. This one shows future goals, linked to bug reports/feature requests and past accomplishments. It gives the new comer the feeling that the project is not dead. Archiveetica Roadmap with lots of detail. CKAN is an open source data portal. This is the CKAN developers’ Roadmap. Another roadmap, albeit a slightly less graphically laid out roadmap, is on the HTML5 Initiative page over in the drupal community. It outlines the things needed to bring the HTML5 to the Drupal 8 Core. While this roadmap is more text based and may appear to be harder to digest, it is in a format that most who are in the drupal community are familiar with and serves the same functions. The initiators of every project need to consider how public they want to be with their project goals. They need to consider how much time they want to spend engaging with the users of the product they are going to create. It might be true that a NGO’s website is not an open source project (two of the above examples are from open source projects). But software and websites share a commonality – they are both dependent on communities of users to be successful. These software packages are more than communication platforms or engineering projects they are the focal point of a community. And as a focal point of a given community, the communities need to be able to express their feedback, concerns and needs; or to contribute to the thought and ideas pushing the project forward. In a software project this is part of the developer – end user relationship. In a website project this is part of the content creator – content consumer relationship. Users Asking for A Feedback and Roadmap feature on a UserVoice forum. Image of the deployment team. In an NGO often times there is a high desire on the part of individuals to be involved not just with their day to day work but with goals of the organization. So, the appearance that the development and implementation team is approachable is important. – Of course how this feedback is acted upon is also a part of the ongoing relationship. Users sometimes know something the deployment team doesn’t. When replacing a very big, iconic, and public website, which has very little to no documentation on the communicative or business functions it serves, there is bound to be some oversights in the what is transferred to a new system. The way people are going to use the site will change, things people used to use the site for will also need to change. Mitigating this felt loss is something that is something that a feed back mechanism and a roadmap can help to facilitate. New users and new use habits. Change is not bad, and when viewed through the appropriate lens, is really an opportunity for website creators to gather a lot of information about the site’s users. By taking the features added to the new site public early, it allows for users to anticipate the change (for better or worse as Facebook found out). If a feedback mechanism is also available it can serve to collect and rank this user feedback. What is crucial is to be able to capture and process the creative ideas. Create an outlet for frustrations, and evaluate the usefulness of suggestions. A roadmap serves the communicative function to allow complainers to see that the designers have thought about the problem and know that a solution is needed. It allows innovators share new ideas and use cases. It allows technical people to share solutions. It a way it becomes a Public Relations conversation and serves as a “meeting place” through the transition from old web-site to new web-platform. To serve this multi-dynamic communicative function, the roadmap does not need to be filled with every detail. (Though it could have links to those details.) 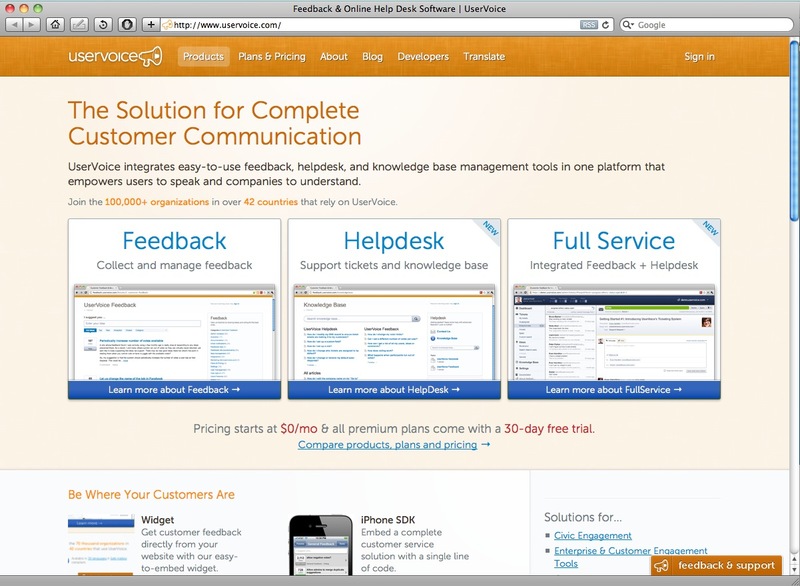 One well designed tool which fills part of the feedback need is UserVoice. UserVoice has received several positive reviews for helping companies engage with their consumers (Review on ReadWriteWeb; review on CrunchBase). A second product which serves a similar set of needs is Interstate App. 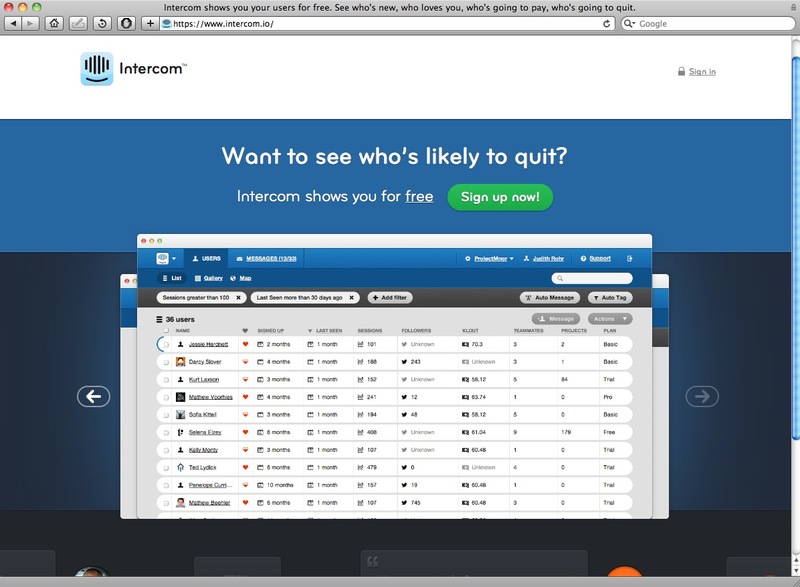 A third product, intercom, focuses less on the feedback side of the equation, but is still a CRMFor those who are un-familure with CRM I am including two excerpts here about CRM and how it is implemented in the business plan. 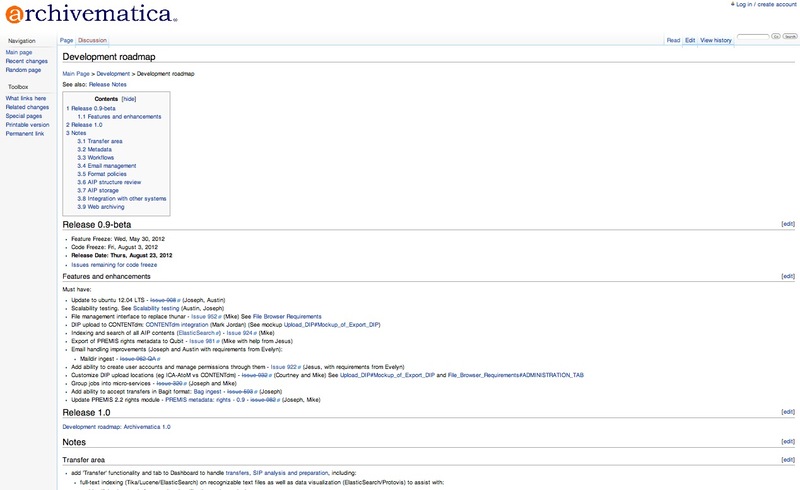 One excerpt is from Webopedia and the other from Wikipedia. While the phrase customer relationship management is most commonly used to describe a business-customer relationship, however CRM systems are used in the same way to manage business contacts, clients, contract wins and sales leads. tool. Customer Relationship Management is really part of an organization’s engagement strategy. Something else worth mentioning is public announcement boards. These are different from Press Releases and also different from Roadmaps. Where Roadmaps are about directionality in a project, announcement boards may be a one way communiqué (even if they have comments enabled). It depends on the level of interactivity that the project organizers want to include. As an example the Facebook Engineering and the Facebook blog both have the ability to receive comments and they regularly do receive over 10K comments a month – they do not reply to them all – but I don’t think anyone expects them to. 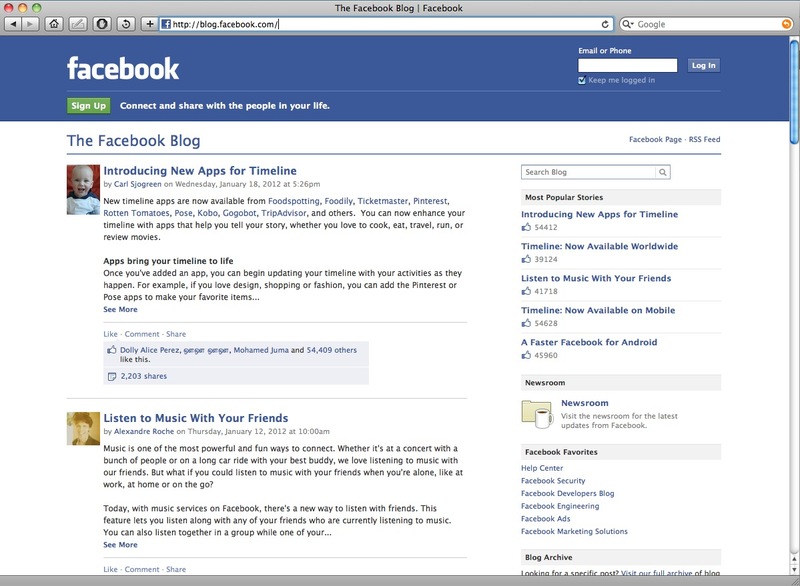 Facebook blog about the Facebook platform. Google also uses several blogs for similar interactions. It lets an audience know what is brewing, if they get feedback there, then ok. But no big deal. 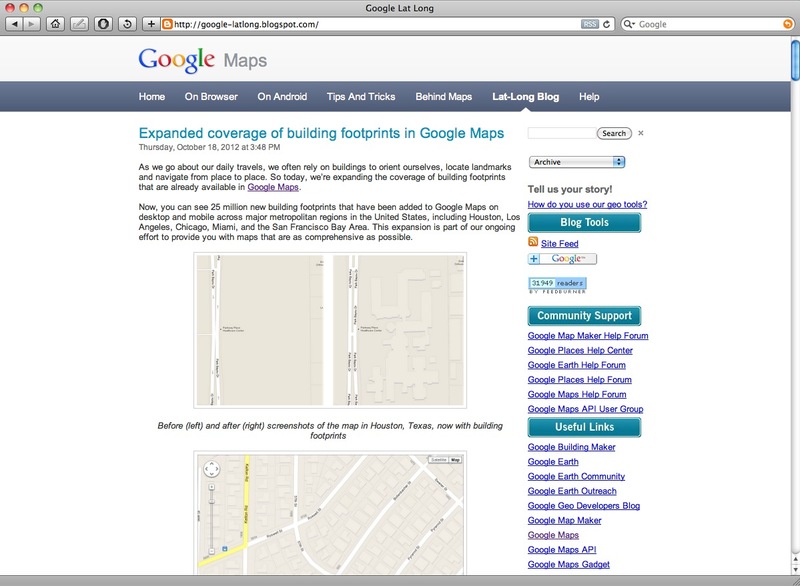 It is probably not the way someone would want to interface with the team Google team (GIS team in this case). However, the WordPress core development P2 instance is a bit different. The group (both developers and interested parties) is smaller and more focused. So, having a conversation might be possible and reasonable. 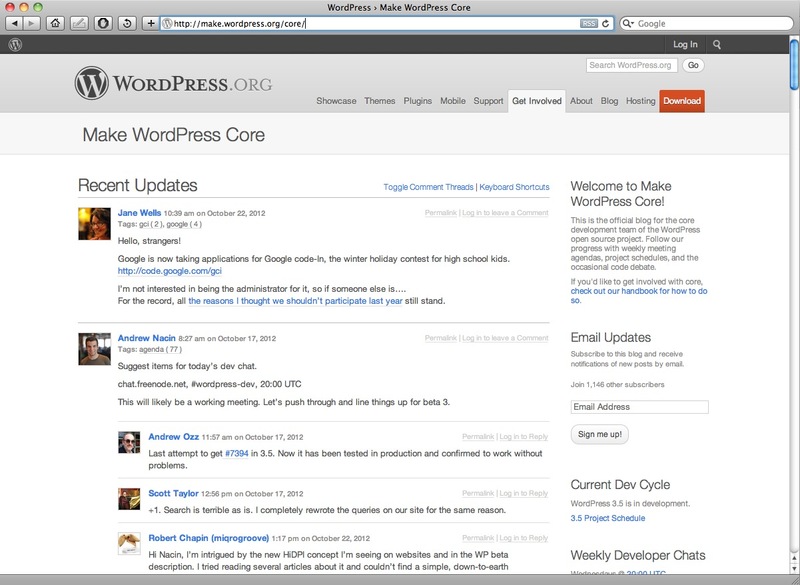 WordPress Core P2 Instance for engaging with interested parties. This entry was posted in CMS, Drupal, Marketing, UI/UX and tagged Consensus Building, Open Source, road map, roadmap, sil.org, social engineering, Web Design by Hugh Paterson III. Bookmark the permalink.